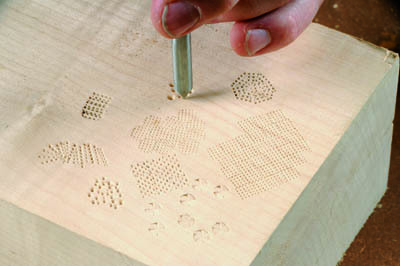 Texturing background on relief carving has been in use for a millennia - this has been done with gouges, scrapers and punches of one kind or another. 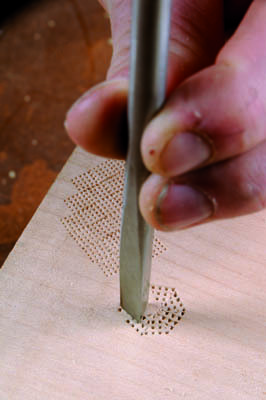 Typically, some carvers have made their own punches to achieve this effect with sometimes nothing more than a sharpened piece of steel or a nail, but as flexible as this approach is, sometimes one wants more consistency, or something more ornate. This set of nine punches from Pfeil may well help in achieving a specific result. Each punch is about 120mm (43/4in) or so, long. The handles have a flattened end which you strike with a hammer should you choose, whilst the blades themselves sport a unique design - some resemble a meat tenderiser in miniature but each have an individual pattern which I have found very useful. Using these punches is simple - pick the design of punch you need to bring about the effect you desire and either use hand pressure or, depending on the depth of the pattern required, give it a wallop with a hammer. Punching in this manner is really very simple. Even with pre-made punches such as these that provide precise, repeatable patterns - and one can create very precise decoration - it is surprisingly hard to create a totally random background pattern. The single point punch provides an option but even using this you find yourself creating a more uniform pattern and having to go back and visually break what you have already done. The blades performed faultlessly. I tried them on harder timbers such as maple, oak and boxwood, as well as on softer timbers such as lime, elder and willow - all to good effect. to employ this type of decoration well. Decoration really doesn't come much easier than this, and it can be devilishly effective.